No, you're not suffering from déjà vu. Those comments you heard from Health Minister Simon Harris last week about the trolley crisis sounded familiar because you've heard them all before. Back in early 2017, there was lots of fighting talk from the minister when the numbers on trolleys reached a record of 612. Mr Harris said he wanted to be the one who finally "broke the vicious cycle of annual overcrowding". The minister said that he was focused on measures like increasing bed capacity, recruiting more doctors and nurses, and agreeing a new GP contract in order to resolve the perennial problem. In particular, he said a bed capacity review would be undertaken as a matter of urgency, to determine what kinds of beds were required and where. The issue of a bed capacity review was first mooted as part of the Government's health plan back in mid-2016. In October 2016, then-Taoiseach Enda Kenny, responding to criticisms of hospital overcrowding, assured the Dáil the review was being undertaken. Guess what? That review has yet to materialise. 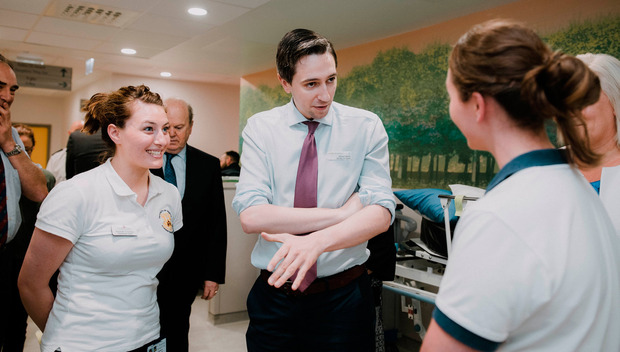 Last week, when Mr Harris was performing what he dubbed his "annual act of contrition" on RTÉ radio, after the numbers on trolleys reached a new record of 677 patients, he said he was still waiting for that report. So, that's 18 months the minister has been waiting for a report that will tell him what we already know - we have a chronic shortage of hospital beds and need more now. But the minister needs to get a report before he's willing to act - and he's prepared to wait indefinitely for it, even as patients suffer. Predictably, last week Mr Harris was again vowing to do whatever he could to increase the numbers of doctors and nurses working in the health service, and speaking hopefully about a new GP contract alleviating overcrowding. But we've heard it all before. Practically verbatim. The same promises to hire more staff, the same commitment to changing work practices, the same reliance on an allegedly transformative new GP contract, and the same assurances that a bed capacity report will provide a roadmap for change. Mr Harris gave all of the same assurances in 2017. Since then, the problem has only gotten worse. As minister, he bears responsibility for that. What is he going to do about it? What concrete measures can the minister take now, today, to alleviate the misery that hundreds of patients are enduring all over the country? Is it acceptable that Mr Harris can postpone decision-making until a bed capacity report is published - but then fail to insist that the report is on his desk within a matter of months, at the latest? While Mr Harris is in no apparent rush to get the report, it now transpires it's actually completed. It just hasn't been formally submitted to him yet. Details of its conclusions were leaked over the weekend. Unless promised reforms are introduced, the country will need between 7,000 and 9,000 hospital beds by 2030. If those reforms are introduced, the number of new beds required will be between 2,000 and 2,500. So, instead of telling reporters he's waiting for the report, why doesn't Mr Harris pick up the phone and ask someone to send it to him? And then start planning on how he's going to fund the cost of those hospital beds - because the report itself isn't going to resolve anything. What will be needed is a huge capital investment, followed by the hiring of additional staff to ensure that hospital beds, when they are provided, can remain open. Can the minister give an assurance that this process will be completed before January 2019? This evidently lethargic approach to policy formation in the health system is nothing new, but it has become a particular feature under this minister - who seems incapable of making autonomous decisions, even after they have been outsourced to get a consensus. The Oireachtas Committee on the Future of Healthcare managed to devise an entire blueprint for a new model of healthcare in less than a year - much less time than the minister has been waiting for his bed review. However, since its report was published in May last year, nothing has happened. The minister, despite insisting that the implementation of the Sláintecare report is a priority, has yet to even appoint the executive who will be tasked with overseeing the necessary reforms. Social Democrats TD Róisín Shortall has asked the Taoiseach the same question every month since August - when will the head of the implementation office for Sláintecare be appointed? Every month she has received the same reply: "The post will be advertised shortly." Speaking on RTÉ last week, Mr Harris would say only that the appointment would be made by April - nearly a year after the publication of the report. Compare this with the speed the Government has set about establishing its new spin unit - with six separate tendering processes already well under way. What does that say about where the real priorities of this Government lie? What is needed in the health service is not more reports or studies or Oireachtas committees. The minister must drive urgent reforms and display a capacity for difficult decisions. For the first time in the history of the State, there is cross-party consensus about the future of healthcare provision. What we are missing is the political will to introduce the requisite reforms. In the past, when the country faced a seemingly intractable health problem, TB, Dr Noel Browne was the minister who almost single-handedly spearheaded a programme that led to its eradication. We need a politician of his calibre today to tackle the overcrowding crisis that is causing so much pain, distress and suffering around the country. Simon Harris has provided little evidence that he is a politician of Browne's calibre. The minister is likely to remain in situ, because no one else wants the job and there is little or no political accountability for persistent failures. Colette Browne In the end, even Theresa May's voice abandoned her. Her deal is now dead and buried, along with her political career. Mrs May was undone by her own intransigence, dogmatism and divisiveness. Colette Browne Peter Casey is not a radical new alternative on the Irish political landscape - but that doesn't mean he doesn't have a future.